Hours: The Arboretum grounds are open year round from 8 am to 8 pm, or until sunset, whichever happens first. 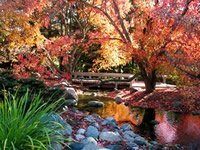 The Arboretum is closed for Thanksgiving and Christmas. This is a paid admission garden for non-members. This formal garden is centered around an elegant English Fountain and each year is planted with different colors and textures. Each spring, the gardeners at the Arboretum plant between 25,000 and 30,000 annuals in this exhibit. Every year the Minnesota Dahlia Society brings new varieties of dahlias to the Arboretum trial garden, where they can be planted and monitored for various traits and guidelines such as growth rate, disease resistance, and quality of the flower. This garden truly shines during the late summer months when the dahlias are in full bloom. Late blooming Chrysanthemums are an excellent addition to any garden as these perennials are available in a wide range of flowers and colors, and they are still blooming when very few other plants are. Guests to this walk in the Arboretum will see over 81 different varieties of chrysanthemums on display. Gardeners in the Upper Midwest region of the country will find dwarf conifers to be among the most exotic plants in their garden. This collection covers a wide variety of plants ranging from the creeping juniper that is only a couple of inches high, to the larger fifteen foot high dwarf spruce. A mixture of rainbow colored tulips greets visitors at the entrance to the Arboretum. Large containers of violas are planted on the terrace, along with bulbs and snapdragons. This collection of wildflowers and hardy ferns extends from the Azalea Garden, all the way into the woods to the hidden pond. Those who venture along the walk will see approximately 20 different fern varieties and 9 different types of wildflowers along the path. Hedge gardens are a very versatile and practical way of using plants, and a great many homes across the country use hedges for various reasons. Not all hedges are made of woody plants either; informal hedges can be made out of herbaceous plants, or annuals and perennials. Many garden designs incorporate hedges to cover up unsightly views, or as borders between properties. The Minnesota Arboretum showcases over 57 different varieties of hedge plants, so if you’re looking for ideas to plant in your own garden at home, this is an excellent educational resource. This area of the Minnesota Arboretum is actually a collection of several display gardens, all nestled side by side so visitors can easily see the wide variety of ideas that are presented here. The various garden themes included are seasonal, rock, cutting, vegetable, patio, herb, and backyards, and even a weed exhibit to name a few. The Hosta Glade at the Arboretum is considered one of the most exceptional of its kind in the Midwest, with over 300 different hostas showcased here. This immense collection of irises includes over 514 cultivars, in all different colors except a true orange or red, and in sizes as small as dwarf varieties that are only a few inches tall, to those that produce stalks as high as 3 feet tall. This garden is at its finest during the prime blooming months of late May through June. This garden is representative of Japanese gardens that were found during the Edo Period, from 1603 through 1869. In addition to the 47 different varieties of trees, shrubs, and ground covers, this Japanese garden also contains numerous traditional elements such as entry gate, granite lanterns, and a water basin. The lilac collection is the oldest plant collection in the Minnesota Arboretum and was planted immediately after the land itself was purchased. The collection contains 179 different specimens, including Japanese, Peking, Preston, Chinese, and French varieties. Lilacs are a favorite the world over for their incredible blooms and fragrance in May and June. The Arboretum showcases a collection of over 150 varieties of dahlias and lilies in the garden. With the lilies blooming in June, and the dahlias in August and September, this garden is a summer wonderland with colors ranging from red to orange, yellow, pink, white, and a myriad of shades found in-between. Recently the Arboretum has introduced the Maze Garden to its exhibits. More than 1600 shrubs were planted among the pine tree collection to create a fun and enjoyable maze for children and adults of all ages. The Minnesota Arboretum is home to one of the largest ornamental grass collections in the US today, with over 200 cultivars and species planted. Also one of the oldest collections in “zone 4”, this garden also serves as a trial garden for the University of Minnesota, Dept of Horticultural Science. Peonies are widely planted in gardens all over the Midwest because of their hardiness, and ability to thrive in alkaline soils. Visitors interested in planting peonies in their own gardens can visit the Minnesota Arboretum and view roughly 240 different specimens. Perennial plants are a staple in virtually every garden planted. However different plants perform better in certain parts of the country versus others. The perennial garden at the Arboretum serves as an excellent educational tool where gardeners can not only learn about the 324 species on display, but they can also learn which plants thrive best in the Minnesota climate.